Bats can be attracted to a wildlife garden. Bats are nocturnal and associated with the night. A few years ago, a bat flew across the garden. It was twilight, when the September sky was still warm and the evening's silhouettes were starting to take shape. It took a while to recognise it as a bat - it was too fast to be a moth, too small to be a bird and too late in the year to be a May bug. There wasn't any other wildlife that seemed to fit the fleeting image of this nimble creature. With no other explanation - it must have been a bat. Further attempts to spot another one over the remaining summer evenings were unfruitful. Although the local woods are home to bats, perhaps the bat in the garden was just passing by. Bats inhabit the local woods in this area of Kent, on the border of Surrey and London; there are several bat boxes strategically placed high up in trees at the nearby woods but there is something so wild and intangible about bats that it can be feel a little optimistic to imagine they might actually live in and around an ordinary garden. Bat boxes up high on trees at the local woods. The classic time to spot bats in the garden is usually on a warm summer's evening - not usually at the crack of dawn. So, this morning brought with it an unexpected sighting in the wildlife garden when a bat flew past at 6.25am, just as the sky was changing to daylight. Strangely, it was in precisely the same spot as the last one spotted in the garden, a few years ago. This time it was unmistakable. It was a very brief glimpse as it was flying so fast. It had appeared from nowhere and must have noticed me standing there as it suddenly veered off to the side. It sounded like it clipped the side of the low-hanging roof as it abruptly changed direction. As it scrambled away, there was something loud in its movement compared to its size - not the sound of feathers but of soft leather flapping; bat wings were fluttering in their jerky movement as it twisted mid-air to avoid crossing my path. The bright, morning sky in the distance lit up its silhouette, which was quite angular - its legs and wings splayed out as it navigated the turn - and for a split-second, it looked just like a bat (rather than a fuzzy little blob). And it was tiny! Locally the pipistrelle is fairly common in Kent; given the size and speed of the bat this morning, it could be have been a pipistrelle that was seen. Attracting bats to the garden. There are a variety of bat boxes and bat houses to consider when planning and creating a wildlife garden. 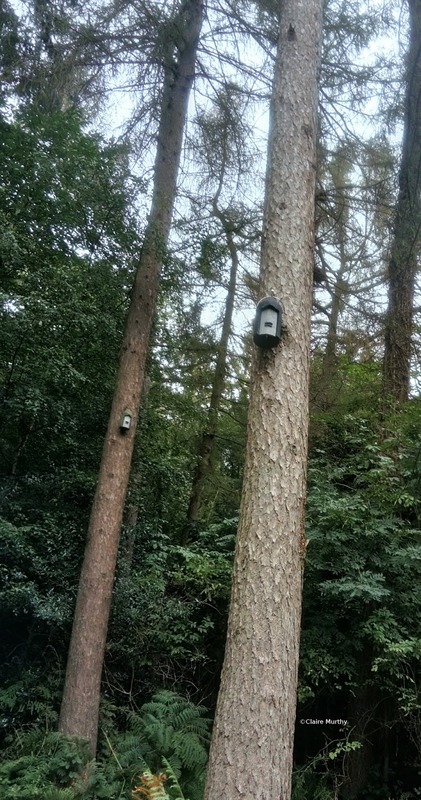 The bat boxes in place at the local woods (see image) are specially designed to be converted to bird boxes, should no bats make use of them but they are not self-cleaning. There are other styles of bat house that are fairly simple to make at home - more on this later.